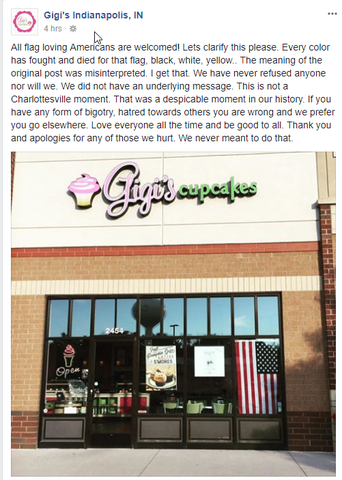 INDIANAPOLIS -- A Facebook post following a heated weekend of discourse has landed Gigi's Cupcakes in some hot water. "All flag loving Americans are welcome!" The post, which went up on Facebook and Instagram just after 9 a.m. Monday morning via the Gigi's Indy account, is simple enough: A picture of a Gigi's storefront with an American flag hanging in the window (albeit not to Flag code) and that simple tagline. On another week, it may have been glossed over, maybe even seen as patriotic, but coming off of a series of exchanges between President Donald Trump and the NFL in regards to protests during the national anthem, many commenters took issue with the words. One man even went into the store while on Facebook Live to confront the owner about the post. We'll come back to the Facebook Live in a moment, but first, a recap: Last week, President Donald Trump called NFL players who protest during the national anthem "sons of b*****s" and said that owners should fire or suspend anyone who did so. The NFL fired back, in a show of unity and in support of the free speech that our country provides for. It started with a statement from Roger Goodell denouncing the president's comments. NFL owners chimed in. Then, on Sunday, every NFL game involved some reaction from teams during the national anthem. Some players kneeled. Others locked arms. A few teams didn't even come out of the locker room for the National Anthem to "remove themselves from the situation". Others went about their business as usual. Opinions on the issue ranged from outrage at the comments made by President Trump to outrage on the players' reactions. No matter where you stand, it's an issue rooted in more than just protests during the national anthem: It's about Civil Rights, freedom of speech and the role of sports in our country. Back to Gigi's: When the post first went out, it was met with dozens of comments denouncing the meaning of the post to be negative toward the actions of the NFL players during the National Anthems on Sunday. The post was edited about three hours after to include some clarity, but many felt it was too late to save face. The post evoked such passion that one man went into the store and sought out the owner (who made the post) while recording on Facebook Live. The two discussed the post, and the owner, Nick, admitted a sensitivity and understanding of the root issues behind the reactions over the weekend, but he was adamant he did not mean ill will with the post. "I will say there is no insinuation," the owner said. Gigi’s has more than 100 locations in 23 states. They are franchised regionally, so the post made by the central Indiana store does not represent the Gigi's brand as a whole.